Author(s): Longfei Yang, Yinghao Zhao, Yicun Wang, Lei Liu, Xingyi Zhang, Bingjin Li, Ranji Cui. Jilin Provincial Key Laboratory on Molecular and Chemical Genetic, The Second Hospital of Jilin University, 218 Ziqiang street Changchun China 130041. Major depressive disorder is a serious mental disorder that profoundly affects an individual's quality of life. Although the aetiologies underlying this disorder remain unclear, an increasing attention has been focused on the influence imposed by psychological stress over depression. 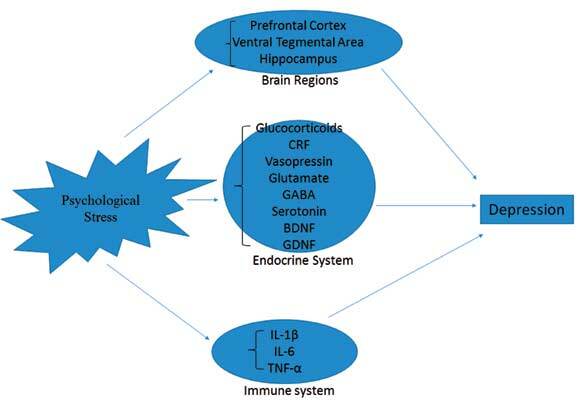 Despite limited animal models of psychological stress, significant progress has been made as to be explicated in this review to elucidate the physiopathology underlying depression and to treat depressive symptoms. Therefore, we will review classical models along with new methods that will enrich our knowledge of this disorder. Keywords: Brain-derived neurotrophic factor, depression, glial cell-derived neurotrophic factor, hippocampus, nucleus accumbens, prefrontal cortex, psychological stress, ventral tegmental area. Keywords:Brain-derived neurotrophic factor, depression, glial cell-derived neurotrophic factor, hippocampus, nucleus accumbens, prefrontal cortex, psychological stress, ventral tegmental area. Abstract:Major depressive disorder is a serious mental disorder that profoundly affects an individual's quality of life. Although the aetiologies underlying this disorder remain unclear, an increasing attention has been focused on the influence imposed by psychological stress over depression. Despite limited animal models of psychological stress, significant progress has been made as to be explicated in this review to elucidate the physiopathology underlying depression and to treat depressive symptoms. Therefore, we will review classical models along with new methods that will enrich our knowledge of this disorder.